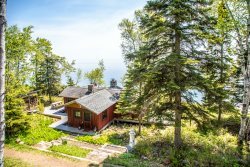 Enjoy this Ski-In/Ski-Out Townhome on Lake Superior's North Shore. The main bedroom has a queen bed and TV with cable. The loft area has two twin beds. The open living area is great for enjoying after a long day of hitting the slopes or exploring the North Shore. The kitchen is equipped with the basics needed to prepare meals during your stay. The lower level bathroom features a shower/tub combo. Caribou Highlands 144C is a cozy 2-story ski-in/ski-out unit at the Caribou Highlands Resort in Lutsen, MN. Relax in front of the wood burning fireplace. The loft area is open to the living area below. The sleeper sofa in the living area provides a sleeping area for 2 guests. The kitchen features a dishwasher, no need to hand wash dishes on your vacation The upper level bathroom is divided into two sections with the vanity out in the loft area and the toilet and shower/tub combo behind it. There is seating for six in the dining room area. This 2-story unit has the living area on the lower level and the sleeping area on the upper level. Enjoy peek-a-boo Lake Superior views from the balcony, located off of the living room. You can also enjoy Lutsen Mountains views in the winter and views of the outdoor pool in the summer. Caribou Highlands 144C is located in the Cedar building next to the main lodge at Caribou Highlands. View of the Birch and Cedar buildings from the outdoor pool area in winter. View of the Birch and Cedar buildings from the outdoor pool area in summer. The fitness center is located on the lowest level of the Alpine Building near the outdoor pool. The fitness center is great for getting in your work out while on vacation. The community gas grill is great for summer and warmer winter day BBQs. The playground at Caribou Highlands is fun for kids year round Note: may be buried under deep snow and not always accessible in winter. Below the Birch building is the indoor pool area. Enjoy the heated, indoor pool available year round. This area also has a hot tub and sauna. Enjoy a game of Ping Pong in the pool area. Book a spa appointment for a relaxing massage. The main lodge building at Caribou Highlands has a gift shop and restaurant. Moguls Restaurant and Bar is a great place to grab a bite to eat or enjoy a drink at the bar. This "Alpine Elite" Condo at Caribou Highlands is a ski-in/ski-out condo located in Caribou Highlands Resort. You'll love this home away from home. It is a top (2nd) floor unit with amazing views of the Superior National Forest and peek-a-boo views of Lake Superior in the winter months. This cozy condo is the ideal getaway for a weekend ski trip or a summertime home base for your North Shore explorations. This condo has a full kitchen, cozy wood burning fireplace, TV and DVD player in the living room, TV in the main bedroom, and WiFi, plus two full bathrooms. So whether you stay here spring, summer, fall or winter you will want to come back again and again. Also, enjoy the private balcony that faces the outdoor swimming pool and the boreal forest beyond. You are just minutes away from many North Shore attractions! This is a ski-in/ski-out unit for the popular Lutsen Mountains Ski area. This puts the mountain right at your back door. During the summer, the Alpine Slide and Gondola are popular attractions. Superior National at Lutsen Golf Course is just a mile down the road and features a full golf course in the summer and miles of fat bike trails in the winter. At this condo you are surrounded by miles of hiking trails and a short drive to Temperance and Caribou State Parks. Grand Marais, with many quaint gift shops and dining options, is just 20 miles up scenic Highway 61.